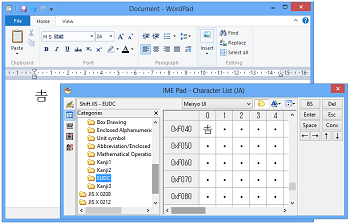 You can easily input/paste the searched character by Super Kanji Search to the other Windows apps. There are three ways to input/paste the character. 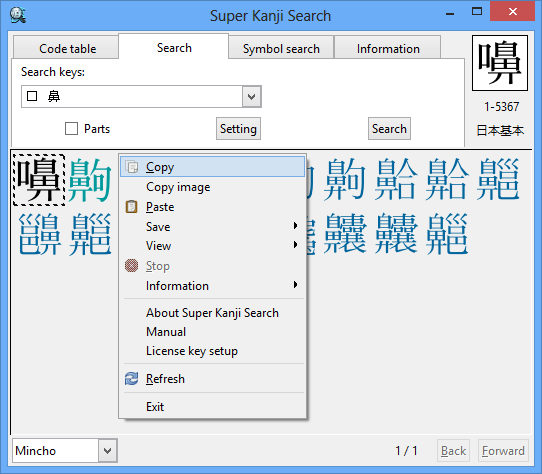 If the searched character by Super Kanji Search is the character included in Windows, you can input the character to the other Windows apps by "Copy" and "Paste" manipulations. 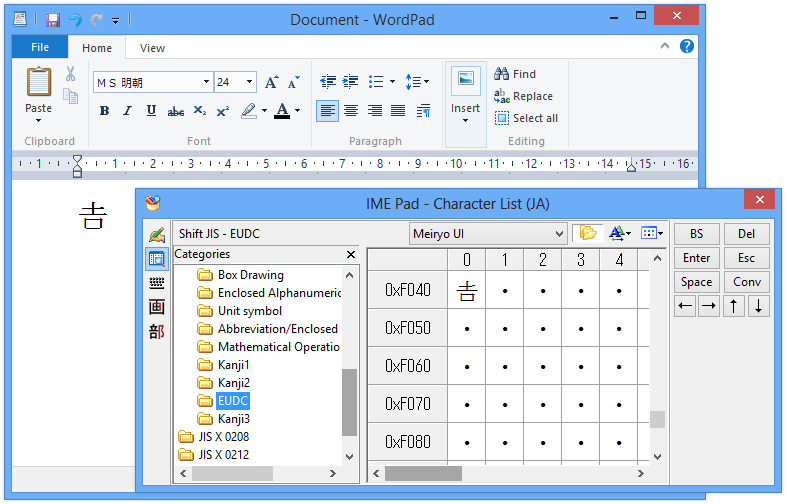 The inputted character by this method is represented as the character code like other characters in Windows apps. That's why you can change the character's font size, style, font and color, as if you change the settings of normal characters. Note: Please confirm the following restriction on this method. 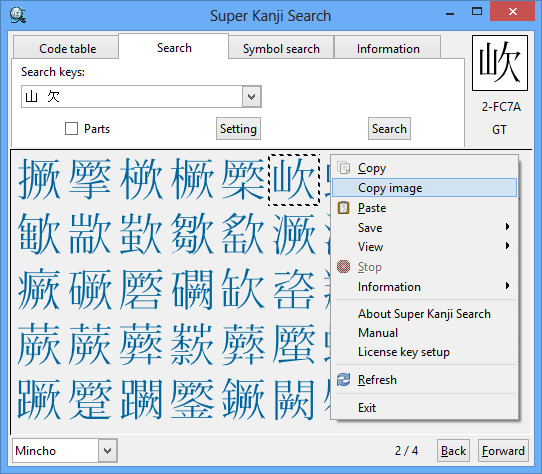 Only when the searched character by Super Kanji Search belongs to JIS Level 1 and 2, JIS Supplementary Kanji, Simplified Chinese in GB 2312, Korean Kanji and Hangul in KS X 1001, a part of Traditional Chinese or kanji and characters in Unicode 2.0 including European characters, you can paste the character to Windows apps as the normal character represented by the character code. For more information, refer to "Primer: (4)Let's Paste Searched Character to Other Apps, Part 1" of Online Manual. You can also input the searched character by Super Kanji Search to the other Windows apps as an image (a graphic image representing the character). 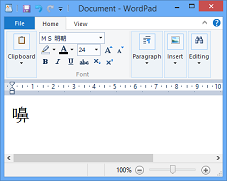 In this method, you can input all the characters in Super Kanji Search to Windows apps. It means that all the characters cover the ones with no character codes on Windows, which are not represented on Windows (e.g. the characters in Daikanwa Dictionary, GT Font and Tompa). Note: Please confirm the following restrictions on this method. Windows apps to which the character is pasted need the function of handling a graphic image. 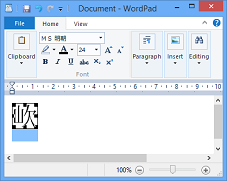 For example, Word and WordPad have this kind of function, but Notepad has no function. The pasted character is represented as a graphic image up to 64-dot, not the real character (the character represented by a character code). That's why you cannot change the pasted character's style, font or color. There are the restrictions on the way of selecting/changing the character size or form. You may also need the different manipulation, not the case for normal characters. There is the case that the outline of the character looks non-smooth when you magnify the pasted character. 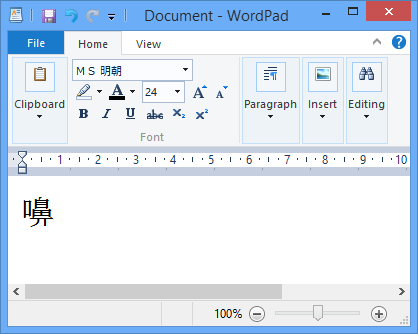 You can register the searched character by Super Kanji Search as an external character of Windows. 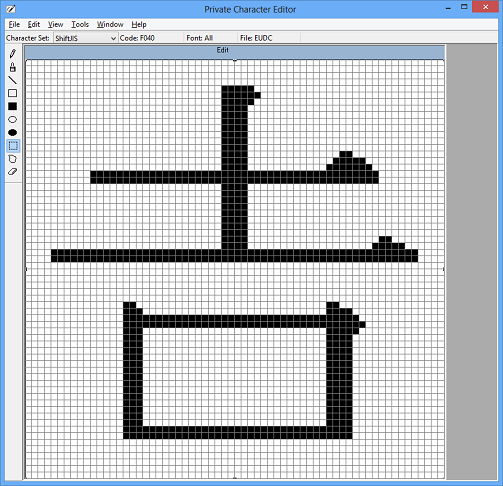 You can also input the character to Windows apps as one of the external characters. Besides, you can change the pasted character's size or color as if you change the settings of normal characters, because an external character is one of the character data, not a graphic image. The external characters can be used only for PC on which you registered the characters. The other PCs cannot display the documents with the external characters. If you want to use the characters in Super Kanji Search for e-mails or websites, this method is not available. 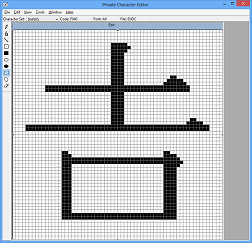 When you register the character in Super Kanji Search as the external character, the 64-dot font is generated. There is the case that the outline of the character looks non-smooth when you magnify the pasted external character. There is the restriction on available number of external characters (If the character code is Shift-JIS, total available number is 1880 characters). You cannot use more than available number of external characters on Windows apps at the same time. For more information, refer to "Primer: (5)Let's Paste Searched Character to Other Apps, Part 2" of Online Manual.